I love RPGs and fighting games. 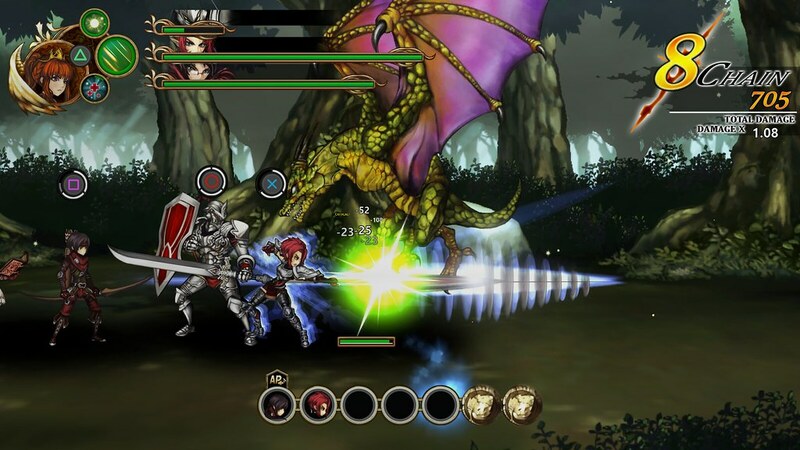 This shows in Fallen Legion’s unique battle system that blends both genres together. 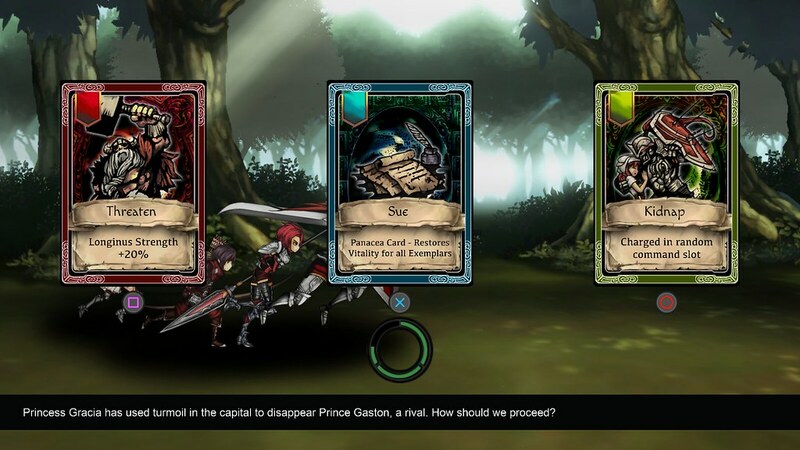 Cecille brings up to three Exemplars — weapons turned into soldiers by the Grimoire — in battle with her. Zulfiqar is heavy hitter who can also protect other Exemplars with his sturdy shield. Longinus is a damage dealer with multi-hit spear strikes. Apollon can debilitate enemies with status effects. Each character has their own action bar and it’s possible to start slashing with Zulfiqar then switch to Apollon to shoot a barrage of arrows. Actually, we want you to do that. If you cancel an attack you can create a powerful link combo which unleashes an Exemplar’s secret techniques. Zulfiqar can smite enemies with his shield and Longinus can drill enemies with her spear. Each character also has a deathblow and whoever lands the last attack on the combo bar delivers their super move. If you want to rend an enemy with Zulfiqar’s Sky Splitter, have him as the last attacker or make Longinus last to pierce all enemies with her spear. Pressing the “L1” button makes characters block and if you time a block right before an enemy strikes you’ll trigger Perfect Guard which can stagger enemies or reflect projectiles. Ever wanted to send a dragon’s fireball back at it? You can do that in Fallen Legion! While Cecille cuts through goblins, she also has to rule Fenumia. Players have to make split second decisions and choose which factions to side with. Your choices affect how the people of Fenumia think of you and what buffs your Exemplars receive in battle. You can get life extending vitality boosts, an extra deathblow slot on the combo bar or a card that allows you to go wild and attack non-stop for one battle. All boosts last for a single stage and if you make different choices, the way you fight monsters will change considerably. There’s so much more I want to say about Fallen Legion like how we create our hand-drawn artwork, what other Exemplars you can summon, and who our story writer is. If you’re coming to PlayStation Experience come up and ask me these questions! Fallen Legion will be playable at the show and we have some cool swag for everyone that comes by to play it. Wow this game looks pretty incredible! I am very excited to see more and check it out as son as possible! Great work on a great looking game so far! Thank you for the kind words. If you’re coming to PlayStation Experience this weekend you can be among the first to play Fallen Legion! Looks Awesome, Will this be coming to Vita? Wow, there are a lot of Vita requests here! No promises, but we’ll discuss the idea and see what we can do. I am thoroughly impressed. This game looks like a lot of fun! I like the female lead :D – Really looking forward to this in Summer. Great music choice too! Maybe a OST we could buy somewhere like amazon or something? The sound track is rockin’. That’s Fandry’s (Creative Director) handiwork he’s got a great ear for music and world building. One of those cases where if the music doesn’t work for you, neither does anything else about the game. This reminds me of Dragon’s Crown. A game I spent over 100 hours on my Vita to get the platinum trophy. If it’s anything like it then my money is yours. Looks great! Vita version please! This game looks ungodly. Day one purchase for me. Well, this seemed to come out of nowhere! Looks great, like a mix of Princess Crown and Valkyrie Profile, which is meant to be a compliment. Are there platform elements, as well, or is it mostly fighting and looting? How are the story elements presented? Looking forward to finding out more – This looks like it has potential. Fallen Legion doesn’t have platforming, but there is a world map to explore. There are story scenes before before stages and within stages too! Cecille may be busy battling goblins, but she has decisions to make on how to rule her kingdom. 2. World exploration. It this done through a map…similar to Puzzle Quest? Is it open interconnected levels? 3. How are missions assigned? This game reminds me a bit of Valkyrie Profile but it also looks like it has a bit of Hands of Fate in there too. Looks great and can’t wait to play. The game system seems really interesting, specially the battle system. I also hope the game can come to PS Vita. This looks fantastic…So relieved it does not come out for a while. My backlog and wallet took a hit during black Friday. Artwork is beautiful. A rpg as well..
Will buy this if it comes on the Vita or when I get a PS4. Good god I can’t wait to play this! Looks phenomenal. Thank you! We can’t wait for you to play it too. Holy crap! Can’t wait for this one :)! This looks great and I was excited until doing a little research and seeing SCE has such little faith in this title that it won’t get a physical release. Hopefully that gets rectified but as of right now my interest in this is gone. Good job SCE. Is there an official site/ fb community to follow game development? Please check out our website at: http://www.fallenlegiongame.com. Hopefully the velociraptors will come in to help out with social media soon! I don’t know if i’ts just me but the battle system somehow remind me the one used on Valkirye Profile from psOne, you should try adding a fill up bar that allows you to perform super attacks, that would be awesome! Anyway your game look amazing and with or without the fill up bar i would buy it day one!!! Just throwing in another Vita request. Looks rather basic, but if it is fun to play, I do not care. I clicked on the video and it says “This video is private”. Maybe post a different one? Try loading it again, YouTube is finnicky like that sometimes. Happens to me often. so i got to play this game in person at PSX and i ABSOLUTELY fell in LOVE with it! the devs are super passionate about their project and they’ve DEFINITELY got something special on their hands with Fallen Legion! I will be purchasing this game on any/every platform including any collectors editions as it was unlike anything i’ve ever played! I’m also here to put in my request for a PS Vita version of the game which i think would be RIGHT at home on the handheld! Also, thank you to the developers at PSX who’s enthusiasm for this game totally blew me away and reassured me that this game is in a class all its own!